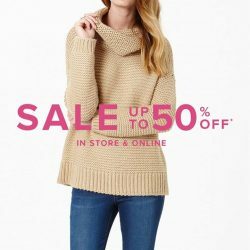 Shop up to 50% off online and in store*. *Up to 50% off the original price. Sale items only. Prices as marked. Excludes gift cards, shipping costs, full price, and Outlet items. While stocks last. Shop at Forever New online for 20% off sitewide! Till 22 April 2016, 9am AEST. *Available online only. Discount applied at checkout. Excluded gift cards and shipping costs. Not to be used in conjunction with any other offer. 3 for 2 on all Jewellery at Forever New! Buy any 2 pieces of jewellery and receive the 3rd free. While stocks last! Promotion is valid till 28 October 2014.